Will you, go, stand speak? Another great essential viewing documentary on evangelism. Are you ready to take the message to the streets the way Jesus did? Let this video inspire you to go out there and serve Jesus! It was at the age of 41 that by the grace of God alone I became a believer in His Son, Jesus Christ as my Lord and Saviour. As an unbeliever in God I never could get my head around the Theory of Evolution that said there was once a big bang and something came from nothing. I’d worked with explosives for several years whilst in the army and never saw order come from blowing things up. Only chaos ensued. The world was to perfect for it to all have happened by chance. To also be told we came from apes was an insult to me. I knew there must be a god of sorts but it was a god I’d made up in my own mind. When I died and came before my god I was going to tell him what a good person I was and he was going to let me into his heaven. I was a drunkard, a liar, a fornicator and a blasphemer and they were just a few of God’s commands I had broken. I am an ex paratrooper and I could be a very violent man at times. I had a terrible problem with road rage. Worst of all though I did not believe or follow the One who died for my sin on the cross, Jesus Christ. I used to keep in touch with a childhood friend of mine called Rachel Westlake. I used to visit her from time to time. In Dec 2004 I visited her and after asked her if she’d like to go out for a drink. Rachel is a believer and she knew that this was difficult for her to do as to be shackled to an unbeliever breaks the Word of God. When I visited though she felt the LORD say to her “he’s ready” but she did not understand what He meant. I was ready. I was a broken man brought low by the LORD with a crippling back condition which I have to this day. I’d had two nervous breakdowns to that point and I was in a bad way. I needed to be broken though and it took six years to get to this point. God is love and when you belong to Him He never gives up on you. That evening went well and we continued to see each other. Rachel gave me some ground rules which I found quite amusing but was willing to go along with. I’d never had a woman give me such rules in a relationship before. Rachel was very involved with her local church working with the youth, singing and various other things. She didn’t used to speak about it much and eventually I got a bit frustrated with it all and invited myself to her church. Watch out though to anybody who was going to talk to me about God! How ridiculous was that? I was going to be in a church for goodness sake. That’s sin for you. I thought the church was ok. They were kind and I got a nice cup of tea and cake as well. I was lonely and it seemed an ok place to be. I never got convicted of sin whilst there though. I wouldn’t sing the songs because I didn’t believe in the One they were singing about. God was already working in me though. I had a very dysfunctional relationship with my family. It was a love hate type. I was softening to them all and beginning to love them as I should. Jesus was changing me. He absolutely loves family. Three months later I was saved. One day on leaving church I picked up a booklet called Just Grace. It was good and it explained the Gospel quite clearly but it didn’t actually go into what sin was and what a sinner I was. God would set me straight on that later. By the time I got to the end of the booklet I was on my knees with tears streaming down my face, declaring to God that I would follow Him and His Son. I believed that Christ died for me and that He had risen from the grave. I believed He was coming again. I was serious with God but I needed Him to prove Himself to me by helping me with my road rage. I used to be a lorry driver so my day to day life was horrendous on the road. That evening on becoming a believer I had a wonderful sense of peace come upon me and a real feeling of belonging. It was wonderful but then God is. The next morning was a beautiful one. The sun was shining and the sky didn’t seem to have a cloud in it. I stood on the drivers side of my lorry with tears streaming again, asking God to prove Himself and help me with my terrible, destructive road rage. He did it and took it out of me. That was the best days driving I’d ever had and I’ve never suffered with this same sin again. The colours were so sharp that day and I drove with a smile constantly on my face. What a day that was! What a LORD He is. Life has not been the same since. I shared with Rachel and others how I now believed and loved God. Rachel and I became married and I later was baptised in the same church. Since becoming a believer life has greatly changed. A different set of problems have come but God is by my side. He has promised never to leave me nor forsake me. To Jesus goes all the glory and credit. He is my Lord. I now preach on the streets of Taunton sharing the Good News with sinners of how the Saviour died for them if they would but believe. Ten years ago if someone had come to me and told me that I was going to be a believer in Jesus and preaching His Gospel on the streets of my home town I would have thought they were crazy! God’s ways are not our ways. He is the Almighty. To God be the glory. Great things he has done. 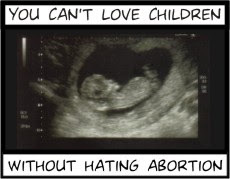 Gen 1:1, 1 Cor 15:3-9. 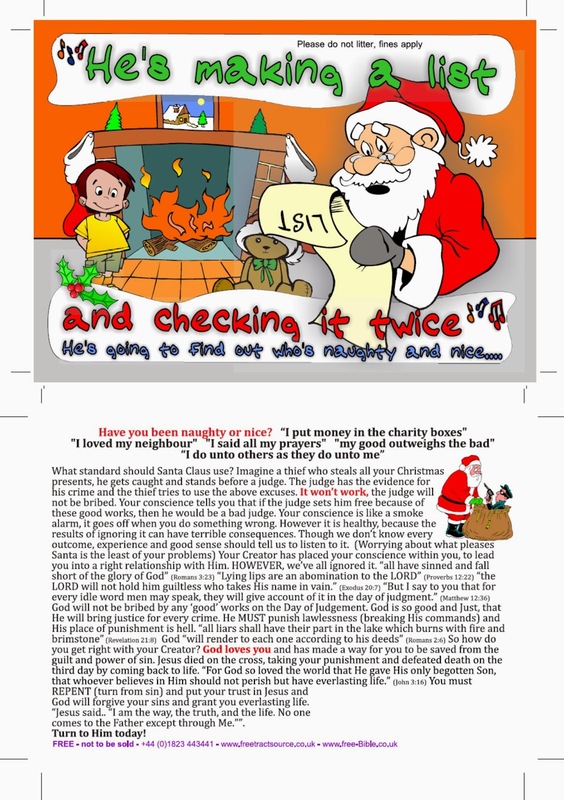 Below is a tract that is available now. It is a new design based on a previous tract that was withdrawn. 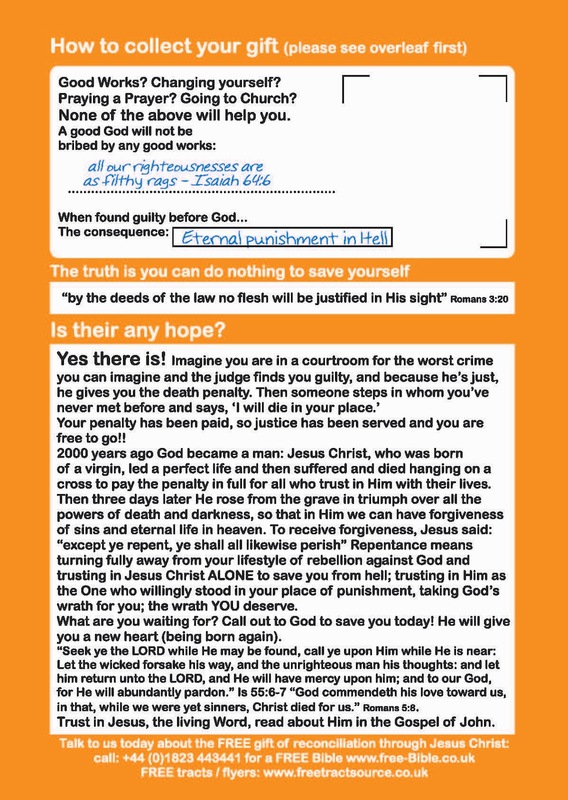 It is A5 and on a 170gsm thicker material than other tracts. It is amazing how many opportunities there are to get the Gospel out in the place we so frequently visit on a day to day basis. Consider how many times you visit a public or even someone else's toilet. Now consider how many times people, including cleaners, visit the toilets. Make good use of your shopping trip, cinema, restaurant or service station visit. You could even make use of a visit to a strangers house. Or deliberately visit a toilet perhaps just to leave tracts. Often a person may spend a lot of time there and may well welcome something to read. The larger the toilet, the more areas you will discover to leave a tract. You have to think like the different people who come in, but also be wary of a cleaner simply taking them all away and putting them in the bin. It should go without saying that you prayerfully ask the Lord to guide you in doing this. Indeed He may well give you ideas other than what follows. One good idea is to carry around blue tac with your tracts. 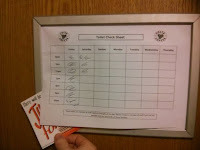 An easy way to leave a Gospel tract anywhere would be to simply tac it to an object or surface. 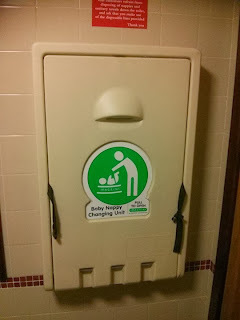 This really is not essential however in the toilet given the number of places one can be left. These common objects are great for holding a tract. 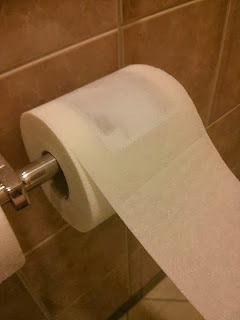 Pull away some of the roll and roll the tract back into it between the paper. Potentially you could do this in every cubicle and reach a great number of people in one visit. You could also, assuming this is true in the room, place a tract or two between toilet roll towers that someone else is likely to find at a later time. Or even pull away some of the roll of each replacement, rolling the tract into each. 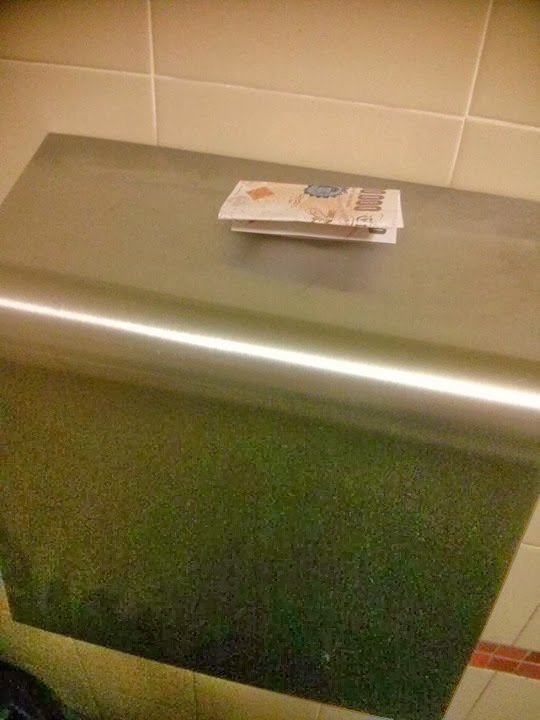 Granted the tract may fall onto the floor when a person pulls away the paper in the cubicle, but that does not mean it won't get read. 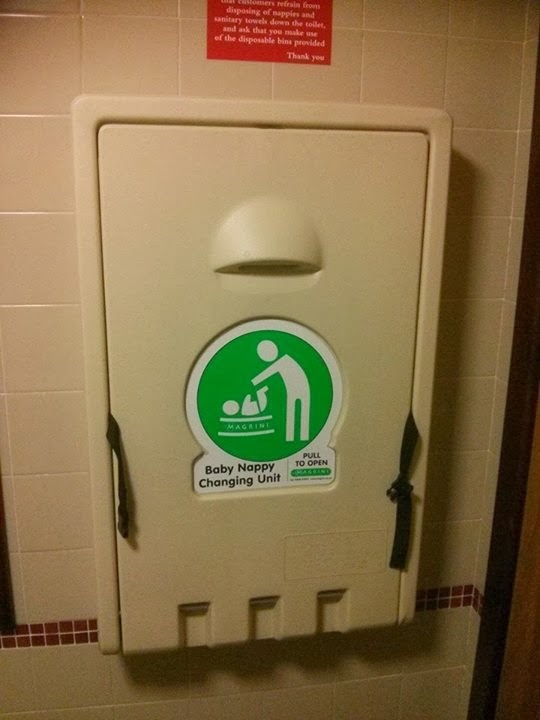 Many modern toilets now have a changing station to pull from the wall and lay a child to change their nappy. The one in the photo nicely folds into the wall and can therefore conceal a tract specifically for the parent with a child when it is opened. 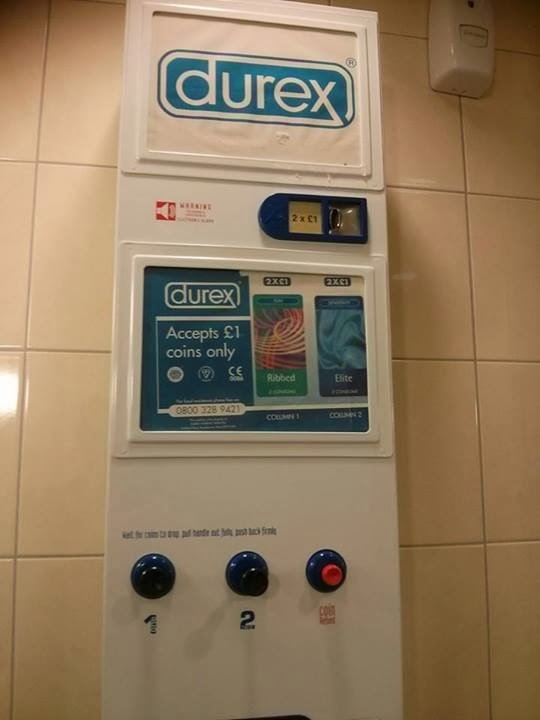 Depending on what the establishment furnishes the toilet with will effect the number of tracts you can leave. 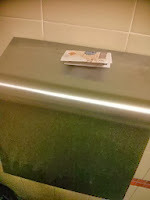 Many toilets I find have blue rectangular hand paper towels. 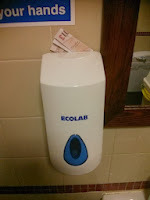 Depending on how these are placed, it may be possible to put tracts between them for the person who washes and dries their hands. It is also worth looking around for towers of such towels to place tracts under for a different person who replenishes the supply. 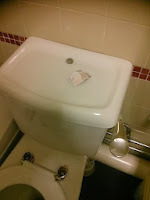 Toilets today often come with various machines. 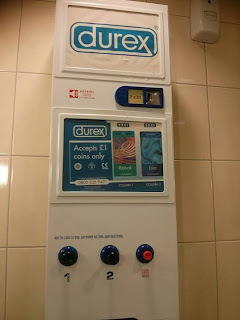 One could easily place a tract in the area where the product or change exits, along with one on the top of the machine, out of view of general people, but ready to get into the hands of another person who opens it up to re-stock. 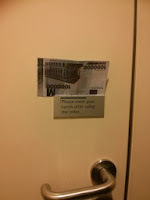 Some times there are places in the toilet that only such people are likely to access. A locked door or section. It is worth seeing where a tract might slot into to be discovered later. It is not alien to some toilets to actually have a sofa or chair in it. People often put their hands down gaps to find change. A Gospel tract could come into their hands here too. Sometimes, toilets have reading material. Anything from a four page leaflet to a newspaper can perfectly hold a tract for someone to view. Some toilets have anything from real plants and flowers to fake trees (toiletrees). 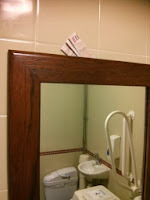 Whichever you may find, you can always put a tract underneath the pot for someone to find. Many areas are capable of holding a tract. 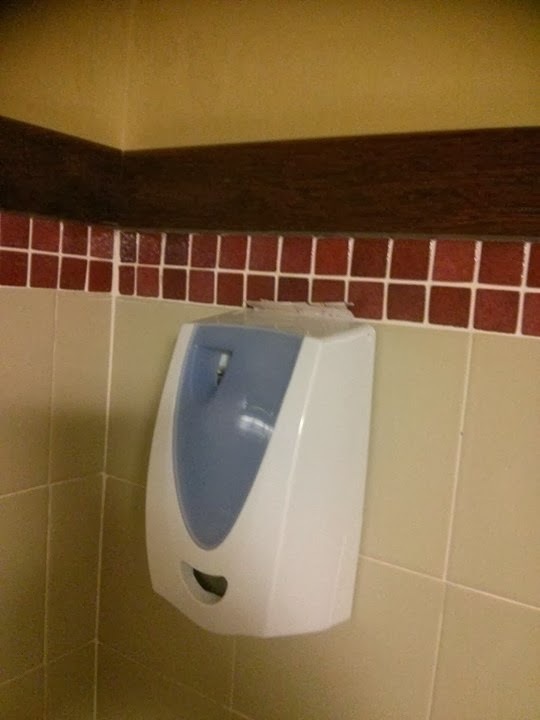 From the gap between the mirror and wall, to the top of the automatic air freshener up high. 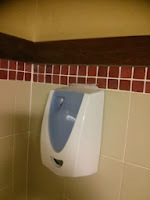 Soap dispensers, information signs, toilet tops and advertising frames. 10. On the main door. 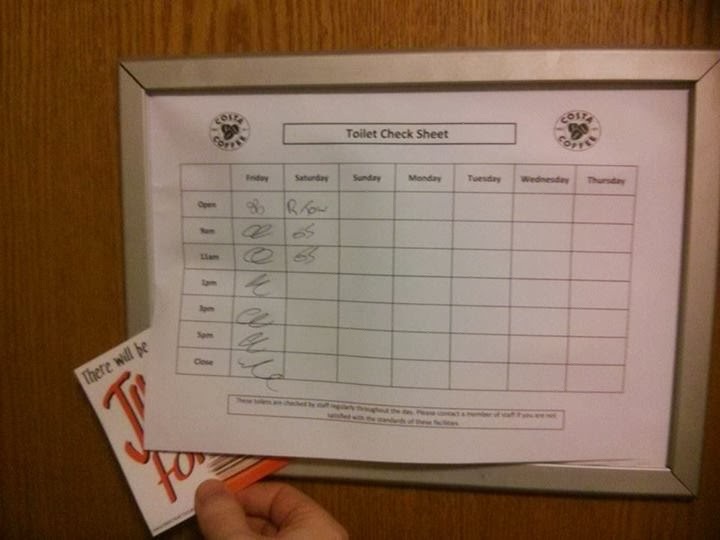 Often in very busy toilets you will find a sheet of paper (a log) that is filled in by the cleaners. This can be held in a frame (as in the image), or in a plastic folder. 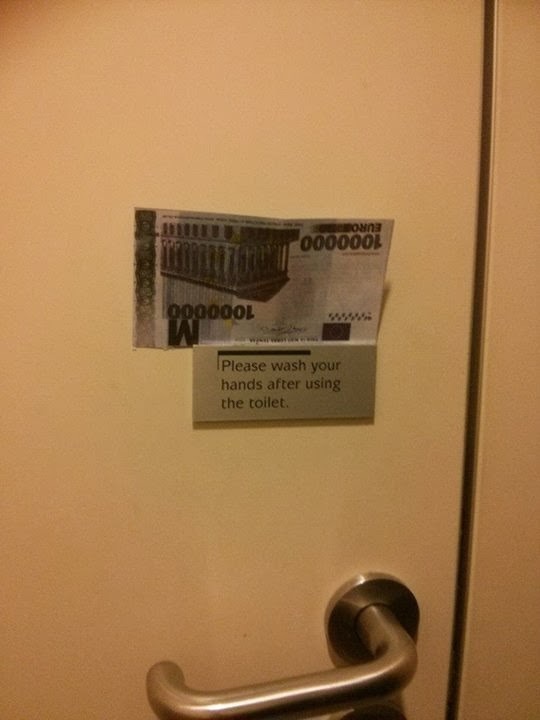 Either way, a good place to put a tract for the cleaner to read (or anyone else that comes across it). 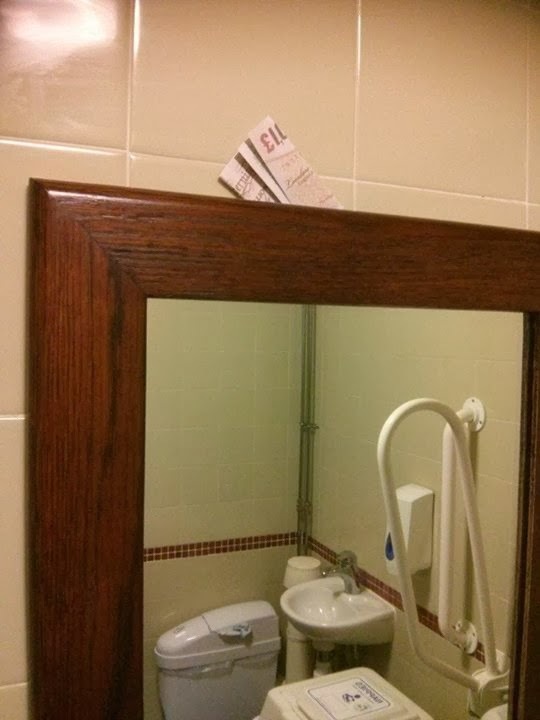 Next time you go to the toilet, can you think of a creative place to put a tract? It is that time of year again!! - FREE Christmas tracts are still in stock! visit us on facebook - join our community! 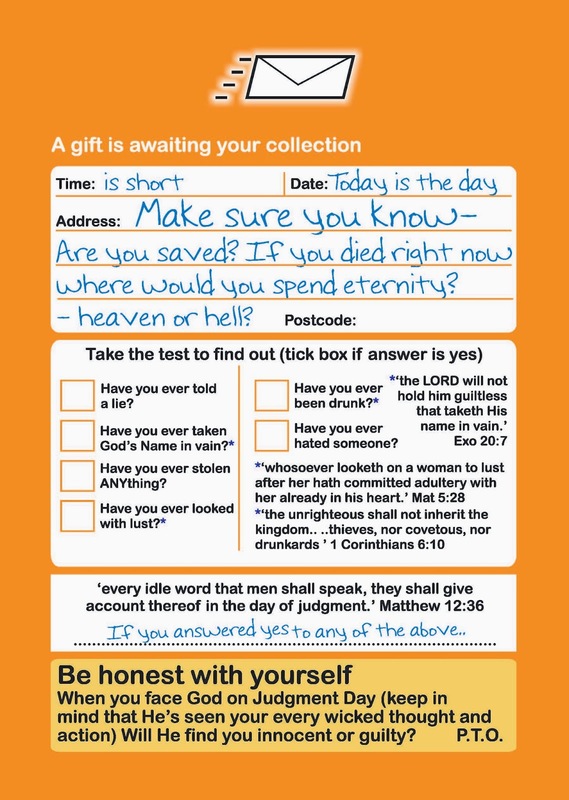 Don't let Halloween pass you by without being armed and ready with Gospel tracts! When people come to your door, they are simply asking for the Gospel. 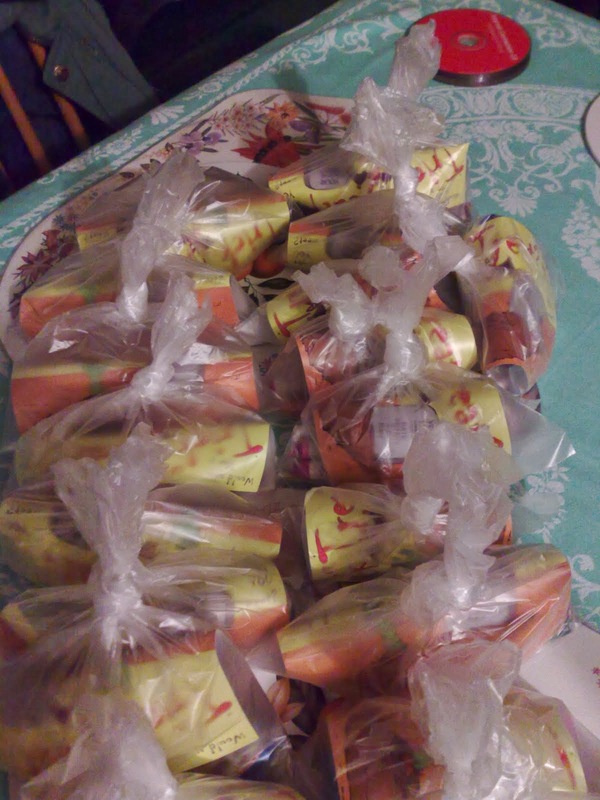 What I usually do is bag up some sweets, along with the tract (image below) and a ten commandment coin! If you would like to know where to purchase the 10 commandment coin, please contact us for more information. alone and sharing the Gospel? 16 At my first answer no man stood with me, but all men forsook me:I pray God that it may not be laid to their charge. 17 Notwithstanding the Lord stood with me, and strengthened me; that by me the preaching might be fully known, and that all the Gentiles might hear:and I was delivered out of the mouth of the lion. 18 And the Lord shall deliver me from every evil work, and will preserve me unto his heavenly kingdom:to whom be glory for ever and ever. Amen. I CAME TO KNOW THE LORD through a simple crumpled piece of paper. It was a gospel tract. For some time in my life I had been very upset. feeling the weight of sin and guilt. I could not find employment, and I decided life was not worth living. One day I went to the railroad station with the intention of throwing myself in front of a passing train. I thought about my parents and realized that if I committed suicide, I would not see them again. I was very confused. While I was trying to sort it out in my mind, the train passed. Here I had wanted to throw myself in its path, but I was too distracted to hear it coming! The speeding train stirred up the usual debris as it went by me - dirt, gravel, bits of waste. 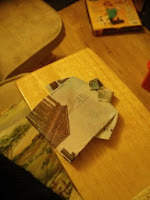 scraps of paper. 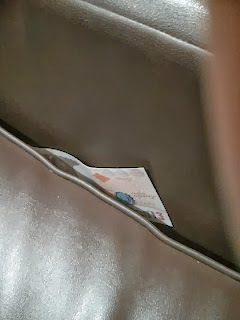 A wadded-up piece of paper rolled to a stop at my feet; it looked like paper that had been used by a vendor on the train to wrap peanuts for a customer. Sitting there thinking, I ignored the paper for a time. But then for some reason I picked it up and smoothed it out. My eyes focused upon it, and I read the words, “Good News,” What news could be good, I wondered? I read further. It said that Jesus Christ is the Son of God and the Prince of Peace. A simple message followed. As I read the paper, I began to feel a little peace coming to me. I read it again and again. Darkness came, so I moved under a light and continued reading that piece of paper, each time feeling more peaceful inside. I thought. Who is this Jesus? As a Muslim I had always been taught to hate the Name of Jesus. But then I didn’t know before that He offered peace! I stayed until ten that night reading that same piece of paper. The peace continued to come to me, and I began weeping. I was not even aware of the crowds of people coming and going around me. Finally I went home and ate some food, but I went on reading that same message throughout the night. I didn’t know how to pray to the Christian’s God, but I began talking to Him as a person. saying, “You claim to give peace. and I don’t know anything about it. But I would like to have the peace You offer.” After that I had a very good sleep. For the next six months I read the same message over and over again. I had nothing else to help me. Then I got the idea that a Christian church would have the Book that the paper talked about. so I found a church. Near the altar was a Bible. After reading some of it. I didn’t want to leave it. Every day I walked six mlles to the church so I could read the Bible for a couple of hours. One day the pastor of the church told me that an evangelistic meeting was going on in a certain place. The meeting was conducted by an Assemblies of God church, and I decided to attend. When I heard the message given by the speaker, I was fully convinced in my heart of the truth being spoken and I surrendered myself to Jesus Christ. I became acquainted with the pastor in charge of evangelism, and he let me buy a Bible. How excited I was to have one of my very own! I continued to attend the meetings. When my parents realized how involved I was, they became very upset and angry. The Muslims from my community began to discuss what they should do about my becoming a Christian. They called my parents to a special meeting in the mosque and told them that their son had been unfaithful to his religion. 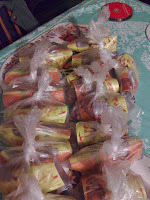 My mother talked with me, asking me to keep quiet about what I was doing because people were not liking what they heard. But I had so much joy I wanted to tell everyone! I borrowed Christian books and read them. One day the people in my community came to me, gathered my books, and burned them. They threatened my parents that if they didn’t drive me away, they would be in trouble. When my parents came under this pressure, they gave me an ultimatum: I would have to leave my new religion or leave them. My family believed that I had become mentally unbalanced. They felt that, if they sent me away for awhile, I would become “normal” again. Before I left, my parents gathered some of the Muslim religious leaders, who performed one last religious ceremony in an attempt to change me. It did not work! My parents sent me away to an island off the coast of my country. What they didn’t know was I had locked my Bible away in a little box, and I took it with me. They believed that some months spent in seclusion would restore my mental health. Actually it gave me an unlimited time and freedom to study the Bible! All by myself, reading God’s Word, I could feel Jesus Christ so close. I read in the Bible about water baptism and I felt I must be baptized. When at last I returned to the big city, I looked up an address that had been given me at the evangelistic meeting. It was a large Assemblies of God church. I met with one of the pastors and arranged to be baptized. Being a Muslim and very family-oriented, I could not resist getting in touch with my family again. They warned me that if I took Christian baptism, they would beat me and never let me enter their home again. But I determined to follow the Lord and I was baptized. Sometime later I went to visit my parents. I found a Muslim religious leader in my house who asked me why I had left my religion to go to the Christians. I told him I followed Jesus because He had given me joy and peace. I explained that Muhammad had spread his religion by using force, but that Jesus Christ uses love, and I had experienced that love. The Muslim leader and my family became so annoyed that they took their shoes off and began to beat me. In my culture, using a shoe for this purpose is a most degrading thing. Then they threw me out of the house and locked the door. For the next three years I had no home. I slept on train platforms, sometimes staying with a friend, going from place to place trying to find employment and a place to live. Through a series of people I met a man in charge of a Christian outreach program who kindly employed me. I have worked there ever since. One day I went to a hospital to visit a patient. There I met a man whom I had known from childhood. Before I was converted, I had belonged to a secret Communist group that petformed various acts of crime, and this man was the leader of the group. Naturally he had become very angry when I became a Christian, not only because we both belonged to the same group, but also because he was a fellow Muslim. When we saw each other at the hospital, I didn’t know what to do except smile. He didn’t want to listen, but I silently asked the Lord to help me speak to him. As we walked outside to an open space, he got a little calmer and asked what I had to say. I knew he was thinking that if he got me outside, he could kill me. During all this time I was praying to the Lord, asking Him for strength. I began explaining why I had become a Christian, telling the story of what I had experienced. I told him that if he would accept Christ, he would have the same peace in his life that I had discovered. For the first time my friend began to listen. I offered to pray for him, and he kept quiet. He would not tell me his home address, but we arranged to meet again. After two days we met again. I had many gospel tracts to give him, and again I shared my testimony. When I asked if I could pray for him to receive Christ, he laughed; but then he gave me permission to pray. I urged him to read the tracts to find out what God could do for him. We set a date to meet again. At the next meeting my former leader told me that when he had left the last time, he had ridden home in a crowded bus. 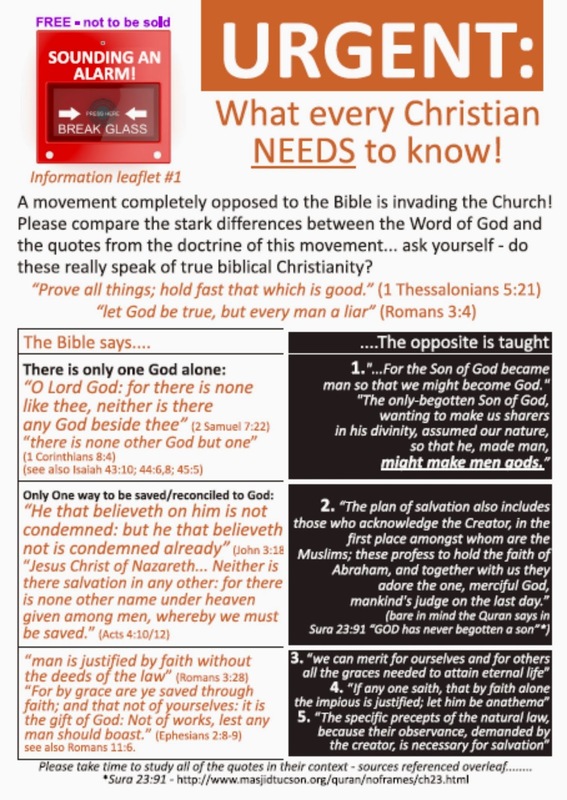 While on the bus he read the tracts, and the truth began hitting him “like a hammer.” He had become convinced of the truth of the message, and now he wanted to know what he should do. I told him to just surrender his life to Christ and receive Him into his heart. We walked to the end of the park and prayed together. With tears in his eyes he said, “I am feeling that someone is touching me.” He asked me to go to church with me, and we attended the next service together. I loaned him my Bible, which he smuggled into his house to read. Eventually he was baptized in water. Now the hunter was the hunted one! He too had to change employment. He could not safely return to his community. Someone in the church arranged a job for him, and he is now a staff member involved in evangelizing others! Though the party people have enticed him with more money and a better job, he cannot go back. He has indeed found the peace of God, and his past life holds no attraction. Previously he had been such a terror, it showed on his countenance. He now has a beautiful smlle, as peaceful as that of a little child. We are both members of the local church and working for Jesus. It was all because of a crumpled piece of paper, spewed out by a speeding train that was supposed to end my life. Instead it brought peace - the Prince of Peace.